Animal experiments suggest a new drug development strategy for treating the symptoms of mania in people with bipolar disorder. Activating potassium channels eliminates hyperactivity in mouse models of mania. Tweet This. In the January issue of the journal Neuropsychopharmacology, Foundation-supported scientists report that they have stopped manic-like behavior in mice by activating cellular channels that allow potassium to exit neurons. Targeting these channels, which are critical regulators of neuronal signaling, could be a new strategy for treating the symptoms of bipolar disorder. By controlling molecules’ passage into and out of cells, pore-like ion channels influence neurons’ electrical properties and, in turn, their ability to signal to neighboring cells. 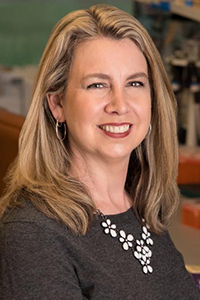 In the new study, a team led by Colleen Ann McClung, Ph.D., a 2016 Independent Investigator and 2007 and 2005 Young Investigator at the University of Pittsburgh Medical Center, studied a specific type of potassium channel called Kv3.1. Kv3.1 potassium channels play a critical role in regulating neuronal circuits involved in movement, motivation, and reward-driven behavior. There is some evidence that inhibitory neurons in these circuits may be underactive in people with bipolar disorder. The team’s hope was that by manipulating the right potassium channels, they could enhance inhibitory signaling and reduce symptoms. To test this idea, they activated Kv3.1 in two groups of mice that typically exhibit hyperactivity: mice treated with the stimulant amphetamine and mice with a genetic mutation that causes several manic-like behaviors. A Kv3.1-activating drug completely eliminated hyperactivity in both mouse models. Genetically manipulating the mice to “switch on” Kv3.1 channels had the same effect. Dr. McClung’s team, which included 2007 Young Investigator Yanhua H. Huang, Ph.D., at the University of Pittsburgh Medical Center, also took advantage of genetically engineered mice that completely lack Kv3.1 channels. Mice without Kv3.1 were hyperactive, supporting the idea that these channels are important for preventing manic-like behaviors. They were also more likely than mice in which Kv3.1 channels are intact to explore exposed or brightly lit areas, suggesting they have greater exploratory drive and tend to seek novelty. Based on their findings, the team suggests that modulating the function of Kv3.1 and related potassium channels could represent a new strategy for developing more effective treatments for bipolar disorder.